Earn $20.01 in Rewards credit (2001 points) What's This? A properly set up double-chainring drivetrain will be a joy to use on the trail, always providing you with the perfect gear on both the ups and the downs. 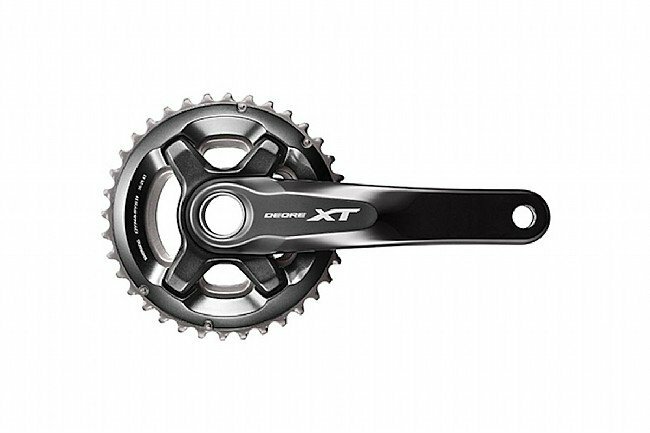 The Shimano Deore XT M8000 2 x 11 Crankset uses lightweight and stiff Hollowtech II construction and a four-arm spider for superior power transfer. Featuring the most advanced Deore XT chainrings ever made, the outer ring features a 3D Composite carbon/stainless steel construction and a combination of stainless steel and alloy teeth strategically located to increase durability where pedaling loads are highest and to save weight where the teeth see less stress. Available in multiple crank lengths and chainring configurations. Bottom bracket not included.